Difference Between a Parrotlet and a Budgie (or Parakeet). There is a big difference between parrotlets and parakeets – more commonly known as Budgerigars, or budgies. First, it’s important to note that ‘parakeet’ refers to a wide range of parrots from around the world. The word itself means simply, ‘long tail.’ There are many types of parakeets, and yes, budgies are one species of ‘keet. So too are Indian Ringnecks, Monk Parakeets (also known as Quakers), conures, and Lineolated parakeets. Parrotlets originate from South America. There are many individual species, but all have adorable stubby tails and a wing span of 3-4″. They are the smallest parrots bred in aviculture, and are known for being like tiny Amazons: A 26-40 gram bundle of fierceness and attitude. They are not cuddly birds, despite the picture below. 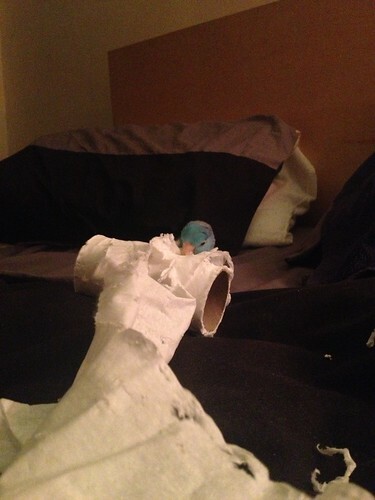 In fact, our parrotlet hardly ever slows down – and this is not uncommon. Parrotlets as pets are typically birds on the go, and not for someone who can’t keep up with that nonstop energy. Baby pacific parrotlet getting cuddles. Budgies are a parrot native to Australia. These long-tailed parakeets are one of the most popular family pets today, alongside the faithful cockatiel. They are slightly larger than parrotlets, ranging from 40-60 grams. Those few grams might not sound like much, but in the bird world it’s a fair difference. They are bred in many colour mutations throughout the world, although green is the variety found in nature. The biggest difference between them is obviously their origin. They are difference species. One originates from South America, and one from Australia, so their ancestors are completely unrelated. Each species has adapted to very different environments: Budgerigars, to the arid desert life of Australia, and parrotlets to the humid rain forests of Ecuador (where, by the by, they are also eaten by spiders). 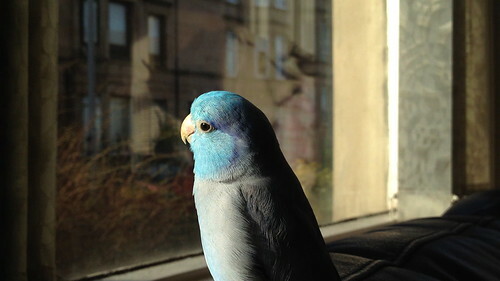 Their voices are quite different, too, Budgies can talk, as can parrotlets, but while budgies generally have a shockingly clear little voice, parrotlets have more of a robot squeak. It is quite cute either way. Pacific (Celestial) parrotlet basking in the sun. Parrotlets are known for being more aggressive than budgies – they are a naturally territorial species with tendencies towards nippiness. That’s not to say that budgies can’t or won’t bite; your parrotlet is simply more likely to. Because of this, budgies are possibly a better bird for those who are timid or wary of a bite. 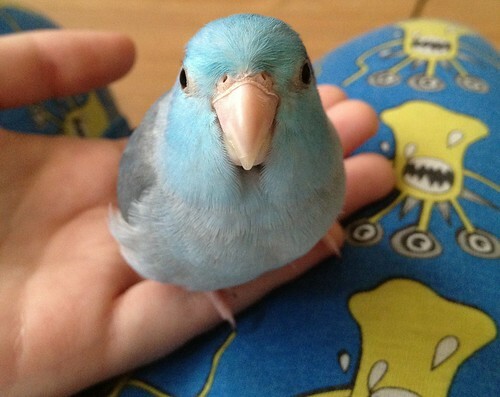 A parrotlet will certainly bully anyone who acts afraid. Their beaks are slightly larger than a budgie’s, too. Both birds live in flocks with complex social structures. Both are parrots – yes, a budgie IS a parrot. So is a parakeet (but a parakeet refers, remember, to many kinds of parrots). Parrotlets and budgies are highly emotional and intelligent in spite of their small size, and are very active – they need and deserve big cages, good diet, toys, and human interaction. Parrotlets tend to be more expensive, especially for the mutations, but budgies can be purchased inexpensively at nearly any pet shop. Parrotlets: A parrot that is always on the go. 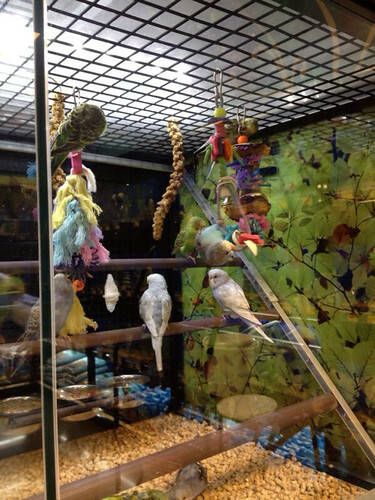 The best place to get a budgie or parrotlet is to adopt! Many lose their homes because owners realise what a hassle these small birds can be if you’re not prepared. If you’re not up for adoption, however, a breeder is best. A good breeder will make sure a baby is properly socialised and healthy. Sometimes (sometimes) pet shop birds come from dubious origins. When it comes to caging, neither species should be housed together – in fact, parrotlets are best housed alone at all times. They will even attack their own mates if housed together. A parrotlet does better singly. Conversely, Budgies can safely and happily live in pairs, or even groups – but this does require proper introduction, as not everyone will get along right away (or ever). Some people will tell you that these two species need to be hand-raised to be properly tame pets, but this is false. A parent-raised bird will be just as joyful an addition. It will simply require a little more work and patience – and there are long-term rewards, such as not having your parrotlet try to drive off your husband/wife/partner/child because it thinks you are its mate. Both these birds are wonderful pets. Neither one should be treated as a cast-off just because it doesn’t cost as much as, say, a macaw, and neither one should be neglected because of its size. Please, buy a budgie or parrotlet because you love it, not because it’s cheap! Zebra Finches As Pets – By Guest Blogger Chelsea of @TWFA. [Mildly] Successful Parrot Blogs: How to Have One. I have to say that I think you write really interesting things about birds and some beautiful pictures. We took our Quaker, Clyde, for re homing yesterday at the Parrot Zoo in Lincolnshire which was heartbreaking (your comments on my blog were appreciated) before we emigrate. We got him at 6 months old and spent time training him to be finger tame and it was massively rewarding as the trust built up. He still retained a wild side but nothing you couldn’t manage. Thank you! Wow, that is tough, but it really does sound like you made the best decision for Clyde. He’s going to be a very happy birdie! I can sympathise, though, for sure. Parrots are rewarding pets, and worth the effort they demand. Thank you so much for sharing! We’ve had our Cockatiel, J-Bird for a year now, and we got her (we think its a she) from a breeder, when she’d just gotten all of her feathers in. We also have a Budgie, Rocky, he is the biggest lover! I just wonder though, is he lonely? I know that the Budgies are social creatures, and after having him for a couple months we are wondering if he is truly happy when we put him back in his house. I would love any thoughts you might have on this. Thank you for a wonderful post about these awesome birds! Hey! Thanks – and thanks for stopping by! It’s hard to tell from the Internet, but I’d guess that as long as you can give your budgie time out of his cage with you, and provide lots of nice wood and leather toys from him to chew in the meantime, he’s probably okay. If you notice Rocky looking lonely (maybe singing, moving, or playing less), you could potentially buy or adopt another budgie friend for him. The catch is that they may or may not bond… it depends on the birdie! You’d have to introduce them slowly. And they would probably need separate cages for life. But if Rocky is singing, playing, and acting normally, he is probably a very happy little guy. Glad you asked – a lot of people overlook budgies, but they are fabulous little birds! Oh, also, the Budgie and Cockatiel live seperately in the same room. Oh, I meant to ask if he and your ‘tiel call to one another? Having them in the same room is a great tactic, as it makes them feel like a flock – even if they live separately, like yours! A good read. Ptak is so adorable! Thanks – and isn’t he just?! He knows it. lol. 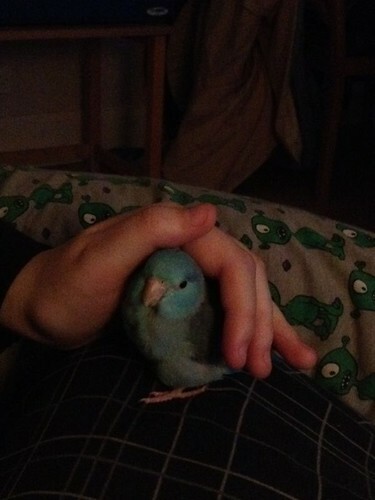 I have a parrotlet too, but he’s nothing like what’s written here or the rest of internet for that matter. Everyone says they’re bundles of energy, but mine is a lazy couch potato. His favorite spot is to sit on top of his cage all day. I gave him calcium and a sepia block to chew on, but it’s been two years and he still hasn’t chewed through them, even though I heard he should be able to chew through those blocks in a matter of weeks. Same goes for the fruit branch I gave him to play with, it’s still very much in tact. I’m sure your bird is well taken care off and it could be that maybe he is an older bird? However, birds shouldn’t be “couch potatoes”, it could be a sign of boredom. My cockatiel loves to hang out on the top of his cage and watch me on the computer, but you have to make sure that’s not all they do. Try finding some puzzle or foraging toys to keep their minds entertained. I dont suppose you have come across any names of parrotlet breeders in Australia? I don’t agree with the statement that parrotlets are “not cuddly birds” maybe it’s just that I’ve been lucky so far but I find them very affectionate little bundles!! We’re still working on our current one but she, and more so her predecessor have been super affectionate. Love rubs and cuddling in under your hair. Sitting on your shoulder. Just being near us. Maybe we have needy parrotlets!! There were times when I couldn’t keep up with the previous little fella’s demands for affection!! I just adopted a 3 yr old male Parrotlet on Sunday. His first owner just caged him and his second owner tried to tame him and gave up. I won’t. He is quite a biter, but he doesn’t get to bite be because I wear a leather glove when I pick him up. I have clipped his wings because I don’t want to have to chase him while I train him. 4 days with me seems to have made a difference because he doesn’t freak out when I put my hand in the cage, but he still is a big way from stepping up onto my finger yet, but it will come (I told Yogi that he would be trained or fed to the cat, who really likes him and is very protective of him, if he didn’t change his attitude. I don’t think it had much effect). They are full of attitude, but I think the bonding is starting because if I leave the room, he chirps loudly. He is a lovely boy, despite his baggage, but I hope he will soon realize that all the pets under my roof have the best life. what’s the difference between a parrolet and a quaker? Great post but I am still confused about how to tell the difference between a budgie and a parrotlet! I found a budgie/parrotlet about a month ago – pale lemon and grey in colour, but I am not sure which she actually is. She is smaller than my existing budgies and definitely very active – but that could be because she is young. I kept them all separate for a month because of possible infection, and now she is living in the same cage as my younger budgie, with the older one in a separate cage as they do not get on (though he was starting to be bullied by my existing younger budgie so the separation was needed anyway – though they are all in the same room together. Am I safe to assume that as the new budgie/parrotlet and the existing young budgie are getting on that she is in fact a budgie? Enter your email address to follow the flock and receive notifications of new posts by email. Students with Birds Blog was founded by me: Sarah, a parrot slave with a penchant for research and a knack for training animals. I strive to help others by sharing my own experiences and posting useful taming and training tips, animal facts, and helpful articles and blogs. In 2018, I rebranded my site as Three Birds and a Cloud Blog. The cloud in question is a Samoyed puppy named Atlas. Currently, we also have (as the name suggests) three birds, a fat cat, rats, a hamster, and a cloud-dog. Hormones and Your Parrot: the Triggers and What to Do. What Parrot is Good for a Beginner? Concerning Cockatoos and Other Pet Parrots. Seven Reasons Why Parrots Are Not Good Pets. Tips for Getting Your Parrot to Eat Vegetables or Unfamiliar Foods.